If you enjoyed the CommonWealth Saga (Pandora's Star ..) then you will enjoy this series. Great story telling, lots of interesting characters, very interesting locations (new worlds and habitats). But the best part is how seamlessly Hamilton weaves the advanced technologies into the story without stopping the narrative every few page to explain them. Hamilton understands that his readers are smart enough to figure it out from context. A welcome relief from the majority of new science fiction. 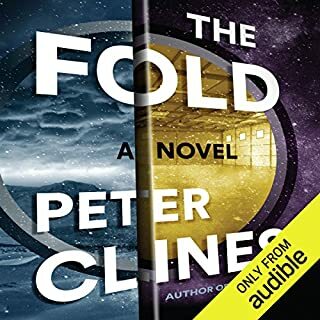 Now if only the next two books in the series were available on Audible! Why do they only have this one? The Reality Dysfunction really leaves the reader hanging at the end. Excellent story. One of the rare audio books that cause me to sit in my car listening for long periods of time after I reach my destination. Really enjoyed it. Plenty of science and a very completing story. There is plenty of room for multiple sequels. 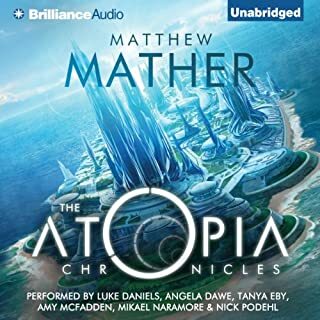 I had high hopes for Atopia and was eager to listen to the story. I knew right from the start that the book was not going to keep my interest. I thought (based on the descriptions) that this was going to be a hard science fiction story. The first 100 pages showed this was at best a very soft science fiction, the kind where the author introduces a new technology without any explanation or background. This is not always a fatal flaw, if the author then moves the story forward with strict rules about the limits and functionality of the new technologies. In Atopia we have a lazy author that never tries to understand the technology they are writing about. Mather uses the technology as a magic wand that behaves differently depending on the immediate needs of the story. Sometimes when the story is lacking the science, it can make up for it with powerful characters that draw the reader into the world. Again Mather fails in a big way, there are many characters and I did not like any of them. I had no desire to see what would happen to any of the one dimensional characters. So I did not enjoy this book at all and would not recommend it to anyone. I can only hope there will not be any more of them, but I fear there will be an entire horrible series. 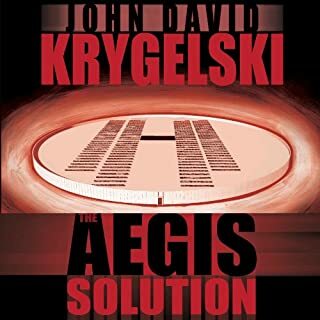 In this, John David Krygelski's third and perhaps most powerful novel to date, he creates a spine-tingling story of suspense, drama, and intrigue. After the only child of the President commits suicide, President Walker proposes an institution where people who have lost all hope may enter. Aegis, intended to be a civilized alternative to suicide, is built and opened. This is a book with many plot turns and mysteries revealed. I must admit I did not expect the direction the book took. The plot moved quickly and the characters were very interesting and made me care about what happened. The only thing that prevented this from being a 3 or 4 star book was the numerous technical problems with the entire Aegis complex. It just keep breaking me out of the plot when the author would just ignore the serious problems with the logistics and engineering of the Aegis complex. The idea that the government would just allow thousands of people to enter a complex like Aegis with no medical care, no food distribution, no repair and maintenance staff. And on top of that leave all the mechanical spaces open the general population (even allow them onto the roof) and then just hope everything goes ok was difficult to accept. I just had to stop trying to make sense of all those plot holes to enjoy the book. 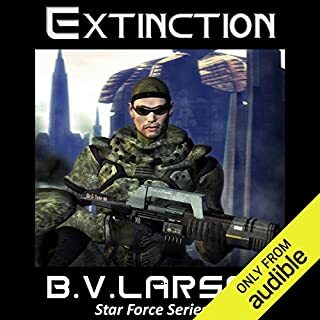 This is the seconds book in the Larson's Star Force series. 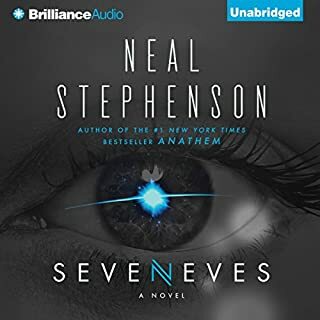 I liked the direction the first book took, I thought there were some interesting things the series could explore and decided to ignore the problems with the first book and see where the second book went. Well now I know, we went to lazyville. Lawson must have written this book in about a week. The plot is silly, the characters are flat and the science has left the building. Very sad, this could have been a very interesting series. I think Larson has the ability to write a much better book. But for some reason he just seems to be cranking out these books like cheap romance novels. Maybe that is how a writer needs to pay the bills these days - Volume. I think there are about another 9 books in this series, but I am in no hurry to read the rest. On the brighter side, Mark Boyett did a great job narrating the book! I wanted to read this before the movie is released. All I can say is, I hope the movie is better than the book. I have read lots of Zombie books (Day by Day Armageddon was the best) and I just did not enjoy WWZ. In my opinion it was just too disjointed, just a collection of short stories with a common theme. There was no character development, no sense of drama, nothing to bring the reader into the story. 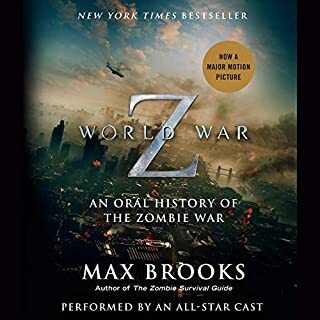 The only thing I took away from the book was the desire to explore the theme of military logistics as applied to zombie warfare. WWZ touches on how the military needed to adapt to zombie fighting but does not really explore the options. A full length zombie novel told from the military leadership point of view would be an interesting read. A lot of reviews are really slamming the narrator, but I thought he did a fine job. The problem is with the producer/director. It appears that no direction was given to the narrator at all, it is the directors job to keep the pronuciations of the names consistent with the other books in the series. But it appears the director did not listen to the other books in this series. So the result was some rather jarring changes in the main characters name and the locations on Safehold. But once I accepted the changes the narrartor did a good job of voicing the various characters and keeping the narrration interesting. As for the story, it did progress a bit in this book. By my calculations we will only need aabout 80 or 90 more books in this series before the humans of Safehold are ready to seek revenge from the Gbaba. 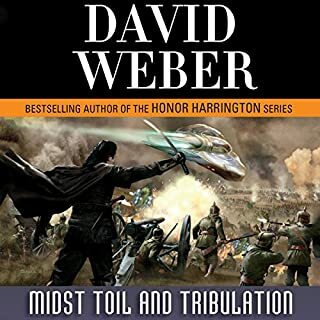 I hope David Weber lives to be 160 so we can have a conclusion to the series. I always wanted to read about the beginning of the Formic war that takes place prior to Ender's Game. 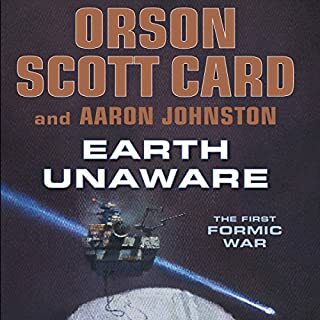 Orson Scott Card has delivered a wonderful account of the events leading up to the war here in Earth Unaware. As always Mr Card is able to create very believable characters that drive the story. The science is bit contrived and the technology described for the asteroid miners does not always hold together or even make sense (in one scene a space craft is "stopped" so repairs can be made then re-accelerated again). But overall I really enjoyed the story and I am looking forward to next book from Mr Card in this current series. Yes, Earth Unaware ends just when things are about to get very interesting for Earth. Will its universe envelop you? The story starts out slow and I was tempted to stop listening several time in the first few chapters. I recommend you keep going, a lot of interesting things will eventually happen. Unfortunately a lot of very uninteresting things also happen. 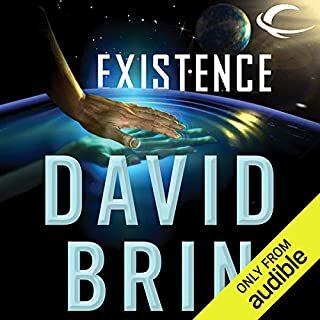 It is almost like Brin had a goal of writing over 500 pages and was not going to let the fact that he only had 300 pages of material stop him. 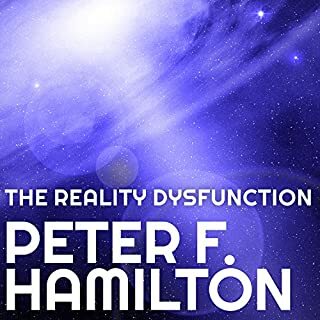 On the plus side, the book has lots of great science fiction material, ancient aliens, machine intelligence's, high tech gadgets, and exploration of the solar system. It even has some very good characters (Human and alien). I also found his plan for how other intelligent races would contact and interact with whatever life exists in the our galaxy to be novel and well reasoned. It explains very nicely why we don't see any evidence of life when look out into the Milky Way. Of course there are also some problems, for some reason Brin is not able to simply tell what should have been a great story. Instead he is constantly interrupting the story with whole chapters that have no relevance to the story or even any real purpose. To make it worse when reading one of the chapters that does tell the story he will invariable end the chapter as if it was the last show of the season for an action adventure series on TV. Ever one of these chapters will end with the narrator saying something like "and then she saw something that will forever change the way we think of the universe" or "then something unimaginable came around the corner" . The chapter then ends and we get 40 pages about something completely different (different characters, different plot line). By the time Brin gets back to the main plot I have almost forgot where the story left off. I can forgive an author for leaving the reader hanging once or twice, it helps to build suspense. But by the tenth or fifteenth time Brin does this is just annoying. It happens so often and with such ham-fisted prose, it becomes laughable which totally breaks the mood of the story. Brin also goes to extraordinary ends to include elements of his Uplift books in the story. Even though they add nothing and actually impede the story. It is almost as if he had a bet with his publisher that he could include 5 chapters about Uplift without making it seem like an unrelated story. I assume he lost the bet. Even with all the problems I am still going to recommend the book, just because I liked the big ideas the book presents.